Hi. I am using a ThinkPad X201 Tablet. 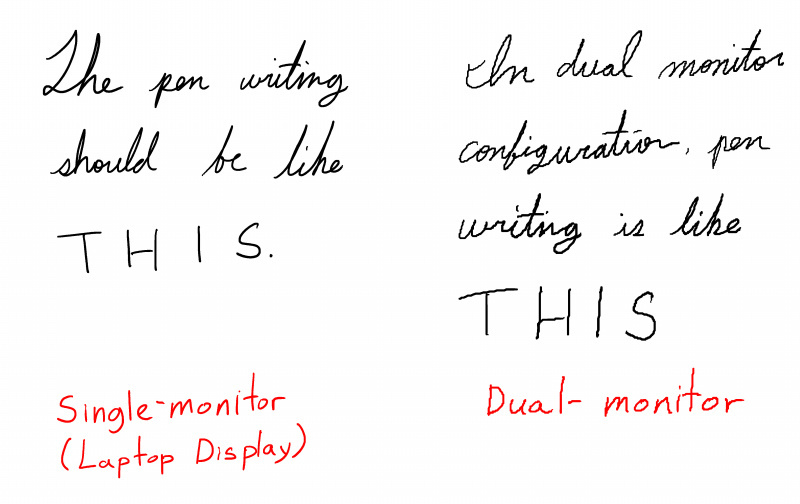 When I first bought the laptop, I had a lot of trouble with the pen tablet driver. The driver didn't work well on my main drawing tool, the Paint Tool Sai. I ended up making a flawsome-yet better then Lenovo official, "Frankenstein" driver out of multiple other drivers of various manufacturers and versions. I was very pleased when I recently re-installed the Windows on the laptop and found that Lenovo had updated the driver. However, even though the new driver fixed most of my older problems, such as calibration not working on certain applications(back then when I was tweaking hundreds of files to make the drivers work, I had to make a decision, between making calibration work in those applications and make the driver virtually unusable in all other situations, or sacrifice the calibration and make the driver work), it didn't take long for me to find that there was another problem that wasn't there before...not critical in many situations, but still, annoying. Everything's OK when I'm using the laptop only, but when I plug the laptop onto the Ultrabase and use the DP port to use the second monitor(in extend mode), the problem happens. I'm not sure what's the reason, but it looks as of the DPI or the refresh rate has dramatically decreased. The strange thing is that the pen still works just fine in some aplications(especially old ones that support wintab...yeah, like Photoshop or SAI). It's the Windows native tablet function(I'm not sure how it's called in professional terms) based tools that are causing the problem, such as Microst OneNote or Autodesk Sketchbook Pro. Check out the image. This is what happens. BTW, my system is ThinkPad X201T 2985a26 configuration. I replaced the HDD into Intel 520 series SSD, and RAM into Samsung 10600 4G RAMS, which makes it total 8GB of RAM. I also added Gobi 2000. Other than that, its all in original condition, and the service center couldn't find any hardware issues. You could throw around your ThinkPad because it won't break. You can still throw around your ThinkPad because it will break anyway even if you treasure it. The BIOS you uploaded is the same BIOS that I have on my laptop at the moment. I think this is the driver issue, not the BIOS, because on the older multitouch drivers this did not happen(Though I won't roll back, because they have terrible stability issues that makes them virtually unusable with the softwares I use). Can you forward this issue to the tech team, so that it could be fix in future updates?